Although I learned to crochet and knit as a teenager, I probably haven't picked up a hook or set of knitting needles in the last 10 years or so. I used to make all kinds of things, from accessories like hats and lace trims to clothing for my little ones. For a long time, I kept the baby sets I used but eventually passed them on to another family member. My grandmother used to knit these sets (usually consisted of a hat/bonnet, a sweater, booties and sometimes a pair of short pants meant as a way to cover the diapers) in beautiful, intricate patterns. The ones I made were crochet, often in shell stitch, and weren't that difficult once you understand the basics of the stitches, and learned how to read the patterns. stopped doing it ... I suppose the knitting lasted longer because living in a cold and snowy climate, they always needed mittens, hats and scarves but eventually when the dollar shops started carrying that sort of thing, I just quit doing it. For years I saved the dozens of sets of knitting needles (some were my grandmother's) and my crochet hooks, and the "stuff" that went along with them such as my grandmother's old pattern books ... (I mean really old, like from the 1930s), stitch markers, row counters, circular needles, large plastic stitching needles, lace hooks and needles ... and a couple of years ago, got rid of about 90% of it. Now I wish I hadn't. 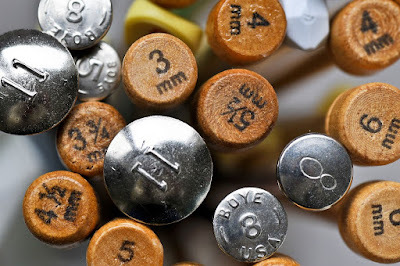 I kept a couple of sets of my grandmother's knitting needles, and all of my crochet hooks (probably considered vintage by now c. 1970s) plus some of my grandmother's. When I decided I wanted something to do for an hour or two in the evenings I decided to pick up crochet again ... the problem? I'm in Florida, and my "stuff" is back home in Canada. I started out just buying one hook (10mm) at Walmart here ($1.98), and some (super soft!) Bernat Blanket yarn to make a poncho ... 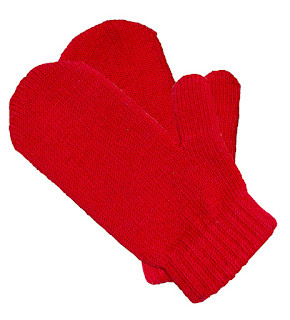 I'd been looking for one for cool evenings, and couldn't find what I wanted. Even after having a 10 year long hiatus from crocheting, it took about 30 seconds (after the initial chain stitch row) for everything I'd learned to come rushing back. The result was a poncho made on the fly - no pattern, just fitted to me as I went. Understanding the basics of increase and decrease rows and what they do and how and when to use them made it pretty easy to create my own pattern. I didn't actually write it down since I had no intention of making another, but ... someone has already asked for the pattern, lol. I started mine at the spot where my shoulders are the widest. Using the 10mm hook, and Bernat Blanket yarn (in variegated brown/tan) I started the base row of chain stitches. Every so often I'd try to fit it around my shoulders, and at the point where it fit around and almost met at the front, I decided that would be the base size. No, it didn't quite meet but I wanted to create a front placket in the variegated brown to join the front together. It was made crocheting rows in single crochet, as opposed to joining and crocheting rounds. The chain row ended up being 65 stitches. 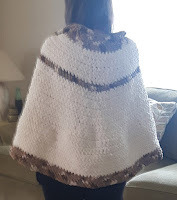 I crocheted two rows (single stitch - the entire poncho is made with single stitch crochet, and in a few places like joining, I used slip stitch) in the variegated brown and switched to the winter white (same Bernat Blanket yarn). The first row of white was 65 stitches across, and I began the increase rows on the next row. I increased 1 stitch in the 10th stitch from the start of the row and the 10th stitch before the end of the row, and in the middle of the row increased 1 stitch in two of the stitches (so, increased a total of 4 stitches in an increase row). The next row was crocheted even. I continued the body in the same manner, increasing every second row until I had a loose fit for the body. Then I crocheted two additional rows in white without an increase (at that point, I had 120 stitches across) and switched back to the variegated brown for a few rows along the bottom. On the last bottom row, I turned the corner at the front and crocheted the placket (with the variegated yarn). Rather than crocheting the placket "across" the front as I'd done with the body, it was done (in single stitch) up and down the body until it was the size I wanted, and joined to the opposite side with slip stitches and finished off the body. 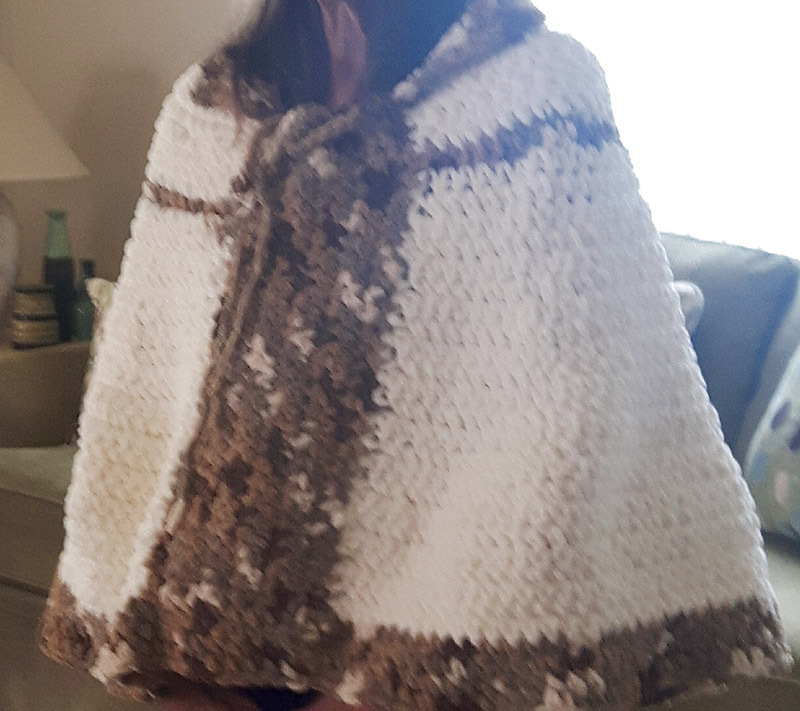 That made the poncho from should to hem, but I still had the upper portion of the poncho to create. Because I didn't have a pattern, starting at the shoulder made it easier for me to gauge the size as I worked on it (which is why I didn't start at the neckline). I joined the winter white at the shoulder, and avoided crocheting across the placket (I wanted an easy open neck) the first row was crocheted even (65 stitches), and then I began decreasing in the same way as I had increased on the body, but because I'm a little short in the shoulder to neck, I decreased by six stitches per decrease row (when I had increased only 4 stitches per row). I continued decreasing every other row until I could fold over the open neck and make a small lapel on the left and right, and then finished it off. To complete it, I crocheted a long chain stitch (70 stitches I think), and did one row of single crochet, and finished that. I hooked that through the top of the placket to act as a drawstring to pull it snugger around my neck if I wanted it. The drawstring still has two long pieces of wool hanging from the ends because when I find the right ones, there will be a large wooden button on each end of the drawstring. 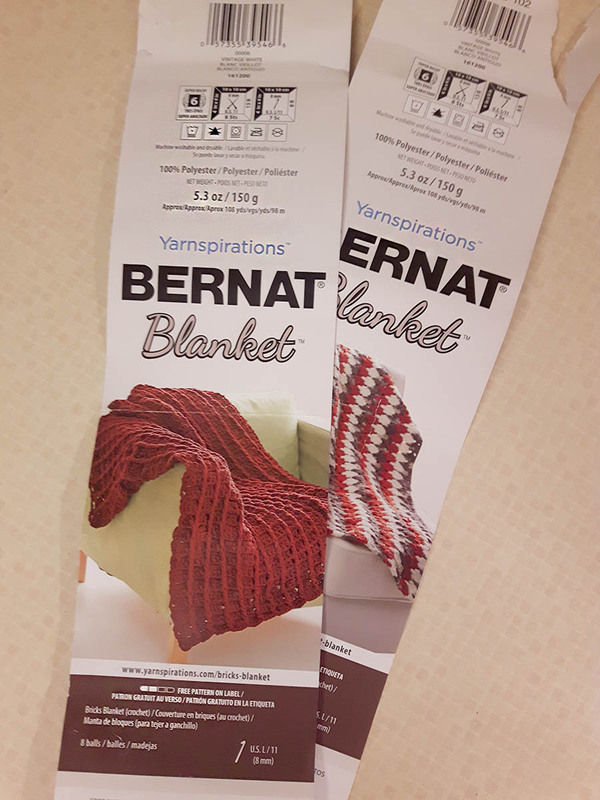 Oh yeah, one other thing ... the Bernat yarn comes with a pattern printed on the inside of the label. Check the skeins you buy and try to buy ones with different patterns. It's a good way to start collecting patterns for beginner crocheters. I'm working a new, very simple beginner project and this time, yes, I am writing the pattern down and will have proper photos (cause I don't have to wear it) and instructions on a sheet you can print.